PC maker Velocity Micro on Tuesday announced the $299 Cruz Tablet computer, a handheld device that is priced significantly lower than Apple’s popular iPad tablet, which is available starting at $499. The Cruz tablet will provide a “truly mobile experience at an affordable price,” Velocity Micro said in a statement. 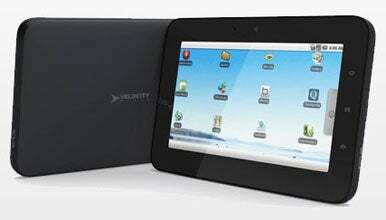 The tablet will come with Google’s Android OS and is slated to become available on Sept. 1, according to the company. However, there are differences between the Cruz and iPad, including screen size and storage. The Cruz tablet comes with a 7-inch capacitive touchscreen, which is smaller than Apple’s 9.7-inch screen. The Cruz tablet will be able to play back 720p high-definition video, said Josh Covington, a Velocity Micro spokesman. The screen will display images at a 800-by-480-pixel resolution. The company could not provide processor details as the device hasn’t reached production phase, Covington said. Velocity Micro is jumping into a tablet market that is growing at a fast rate, primarily driven by Apple’s iPad. Apple in June said it had sold 3 million iPads in the first 80 days after its release. Research firm IDC has said tablet shipments could top 7 million by the end of this year and exceed 46 million by 2014.